(Nanowerk News) Imagine the marriage of hard metals or semiconductors to soft organic or biological products. Picture the strange, wonderful offspring –– hybrid materials never conceived by Mother Nature. The applications in medicine and manufacturing are staggering, says biologist Steven Lenhert, the newest faculty face of nanoscience at The Florida State University. Assistant Professor Steven Lenhert of the Florida State University is a faculty member in biological science and a member of the university's interdisciplinary "Integrative NanoScience Institute" (INSI). How about a mobile phone fitted with a "lab on a chip" that can diagnose illness? That and much more are real possibilities, according to Lenhert. "Nanotechnology is already saving lives, and will be crucial to the sustainability of life as we know it on Earth," he said. 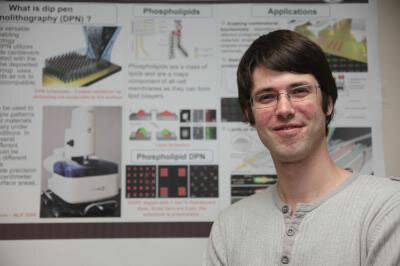 Lenhert is the lead author of a groundbreaking paper published in the April 2010 edition of Nature Nanotechnology –– the discipline's premier journal. At age 32, he is internationally recognized for his innovative work in the evolving field of bionanotechnology –– the union of biology and nanotechnology –– and a related process, Dip-Pen Nanolithography (DPN), which uses a sharp, pen-like device and "ink" to "write" nanoscale patterns on solid surfaces. Both are capable of producing materials with enormous potential not only for diagnostic applications in health care but also for virtually any field that uses materials, from tissue engineering to drug discovery to computer chip fabrication. In other words, it is big-deal technology on a nanoscale. Nanotechnology encompasses objects that measure just 100 nanometers or less in at least one of their dimensions. One nanometer equals a billionth of a meter. "Think of one nanometer as the length that a hair grows in one second," Lenhert said. Florida State hired Lenhert to further enhance the interdisciplinary cluster of faculty who form the Integrative NanoScience Institute (INSI) –– a key part of the university's ambitious Pathways of Excellence initiative. His cutting-edge work in nanobiology is expected to serve as an ideal complement to the materials science and engineering research already underway there. Together, they mean to make the institute a world-class bionanotechnology center. As an INSI member, Lenhert will collaborate on the Institute's cutting-edge research with distinguished faculty from cell and molecular biology, chemistry and biochemistry, materials science, chemical and biomedical engineering, and physics. The paper he and coworkers published ("Lipid multilayer gratings") in Nature Nanotechnology describes a DPN-based technique he devised at his former institutions, Germany's University of Muenster and Karlsruhe Institute of Technology. The technique has promising biological applications. It enables the color-coded detection of various molecules through diffraction of light and thin, nanoscale layers of lipids. "We ended up with a fundamentally new class of material –– in effect, a biometamaterial, which is a biomaterial that doesn't exist in nature," Lenhert said. "It acts as a biosensor, which responds to the presence of a biological agent by combining a sensitive biological element with a physical device," he said. "Our biosensor actually makes the physical device out of the biological element itself. "The closest real-world application for this material is in medical diagnostics," Lenhert said. "The idea would be to have a portable, affordable and disposable chip that could allow your mobile phone to diagnose medical conditions that currently require a visit to a doctor and samples being sent to a laboratory. This concept is known as 'lab on a chip,' and it could analyze, say, blood or urine. A home pregnancy test is a similar example that already works, but other kinds of tests still need actual, advanced laboratories." Lenhert is a chess master who plays competitively, when he's not in his laboratory. Born in Salt Lake City, he received his doctoral degree in 2004 from the University of Muenster. Until recently, he was leading a nanoscience research group in Germany. Then, at a conference in 2009, he came across a Florida State flyer about the Integrated NanoScience Institute. "As a graduate student I was lucky to be able to work as a bridge between different departments, including biology, medicine, chemistry and physics," he said. "I realized that a lot of the solutions to a particular problem might already exist just across a street. That's why I like the INSI cluster at Florida State, because it is based on this principle." "Steve Lenhert is not a traditional biologist — he is doing tomorrow's biology today," said FSU Professor Bryant Chase, chairman of the biological science department. "His training in nanotechnology as well as biology allows him to answer biological questions through novel experiments that could not have been performed before," Chase said. "He is designing new tools with unprecedented applications in science and medicine. He also participates in an initiative called 'NanoProfessor,' which teaches faculty how to make nanoscience more accessible and engaging for undergraduate students. Steve is a 'wunderkind.'"